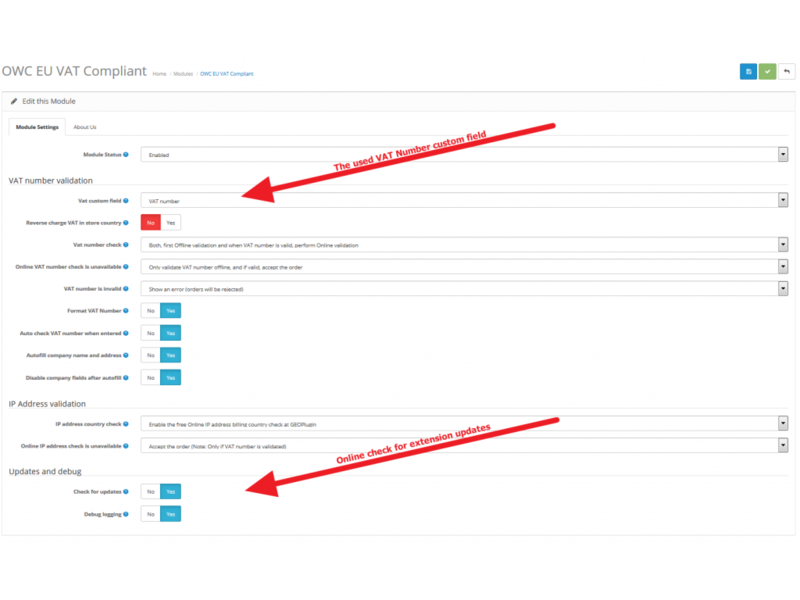 NEW: Ajax validation and autofill company data from VIES! You are also required to obtain two pieces of country evidence of the buyer's location. For every order, you can use the buyers billing address and the buyers IP address for the country as evidence. The EU VAT Compliant extension allows you to collect and validate EU VAT numbers on your registration and checkout form, exempt businesses from VAT if neccessary, collect and validate user location in B2C transactions, and handle the EU Tax requirements for digital goods. 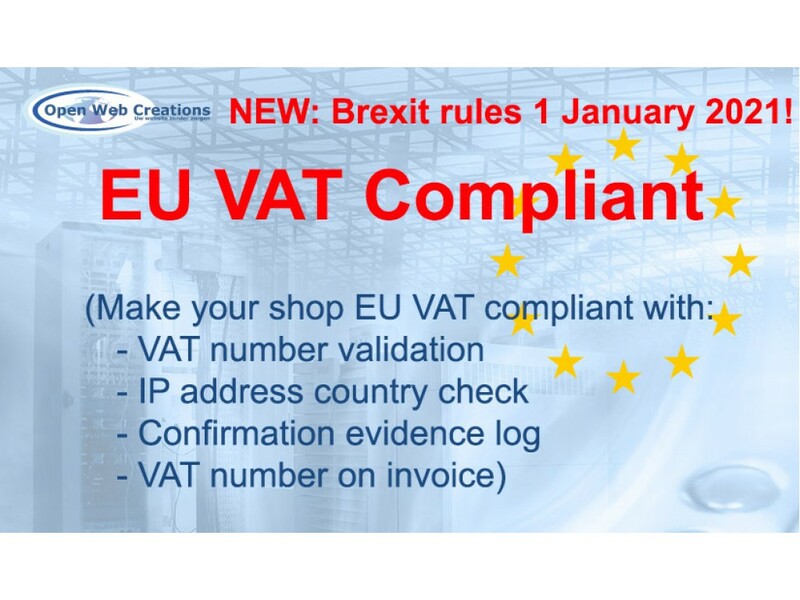 The EU VAT Compliant extension will adds a 'VAT number' custom field to the registation form and checkout form (both registration & guest). 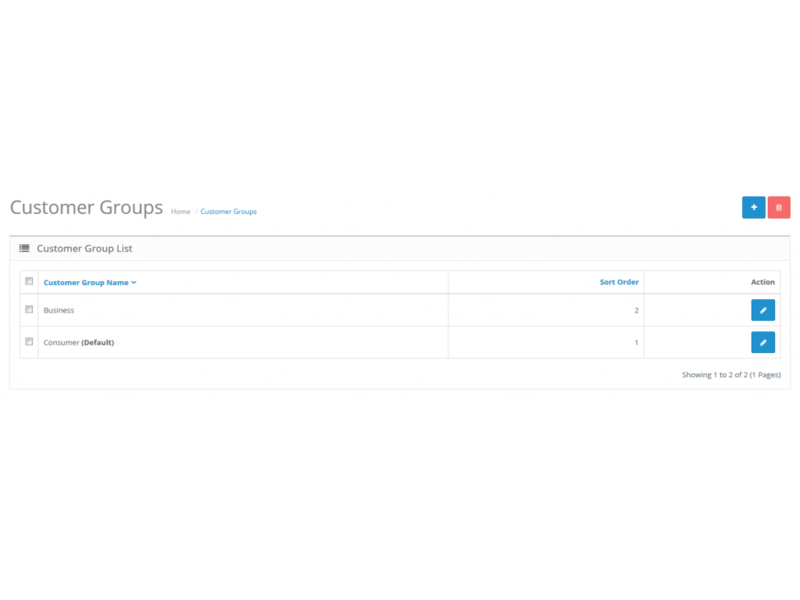 The buyer can select the type (Customer group): Customer/Private or Business and based on this type the VAT number field will be visible or hidden and will be validated if needed. 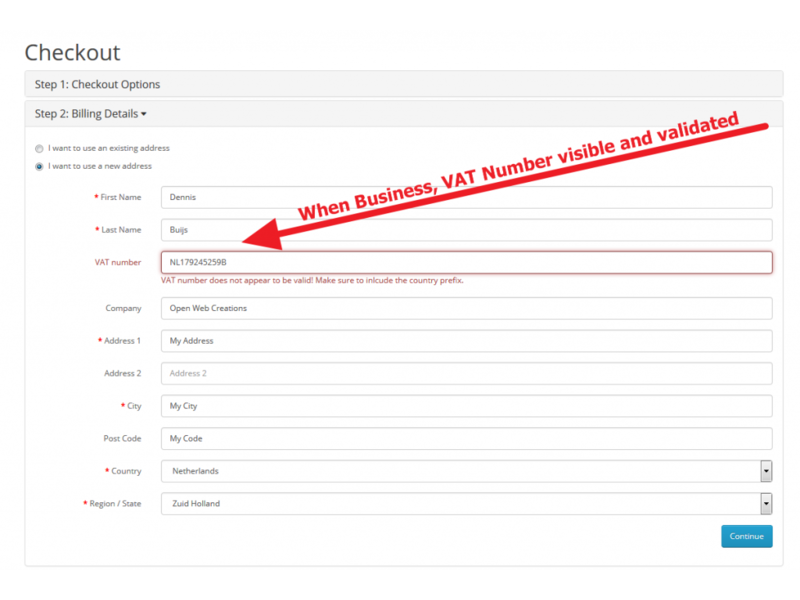 When type is Customer/Private, the VAT number field will not show. The buyer is generally charged for VAT taxes according to OpenCart standard config. In this case if they are an EU buyer they are charged with the VAT of their country, non EU buyers are not charged with VAT). When type is Business, the VAT number field is visible, but optional. If the VAT number is filled in and validated, this buyer is not charged with VAT tax (Reverse charge - VAT exempt), even if they are an EU buyer. EU VAT extension contains two methods of VAT number validations, online and offline validation. The online validation will use the free API from VIES (ec.europa.eu/taxation_customs/vies) to validate the VAT number against the VIES VAT Number Database. The Offline validation uses dedicated algorithm for each country to validate the VAT number syntax. 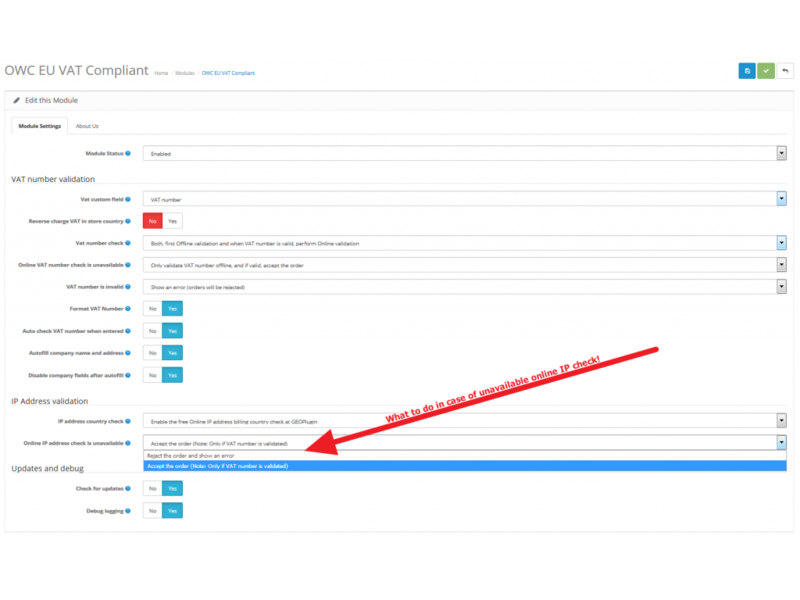 Which validation method is used can be configured in the extension settings, Offline, Online or both. 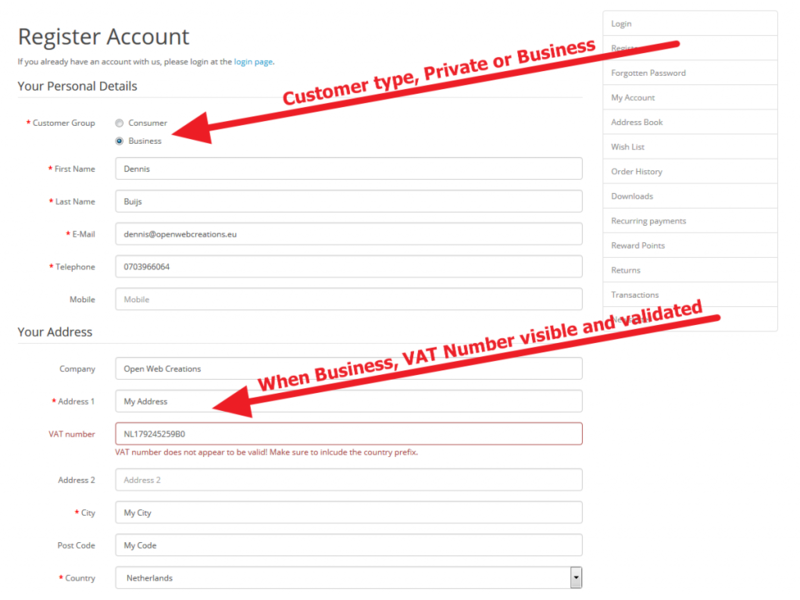 On every location and form, front-end and admin, the VAT number can be changed and will be validated. During each new order the VAT number will be validated again before the order can be completed, so when a VAT number of a registred buyer is no longer valid, the buyer will asked first to edit his VAT number before completing his order. The VAT on digital goods must be calculated based on the customer location, and you need to collect two pices of country evidence, the billing address and the country based on the IP address are the most easy ones. 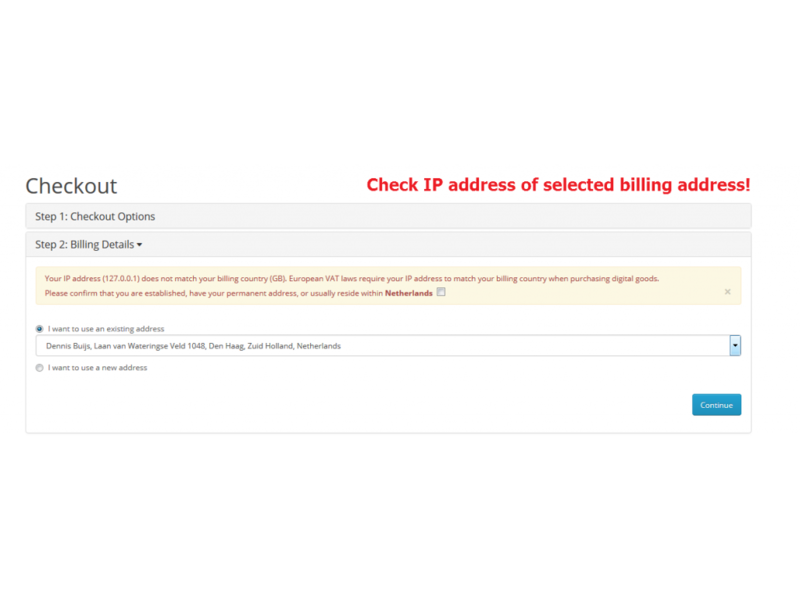 With the free Online IP address service from GEOplugin (www.geoplugin.com), the billing country will be validated against the IP address country, if they match, the order can be completed. When the country mismatch, the buyer will be noticed and asked to confirm their billing address is correct before completing the order. 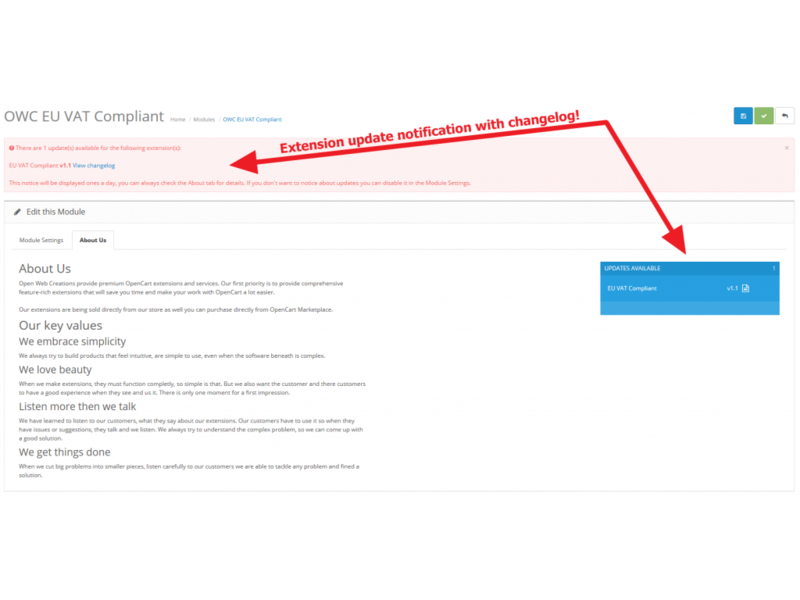 This confirmation will be logged in the 'Customer Activity' log and in a special evidence logfile 'owc_euvat_ip_address_confirmed.log' in the system log folder. 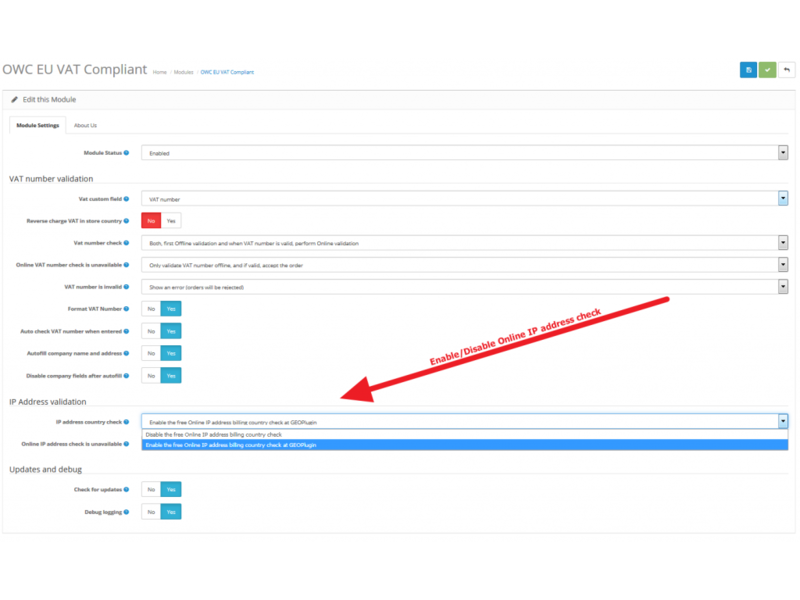 Compatibility: EU VAT Compliant works well in OpenCart version 2.0.0.0 and above. 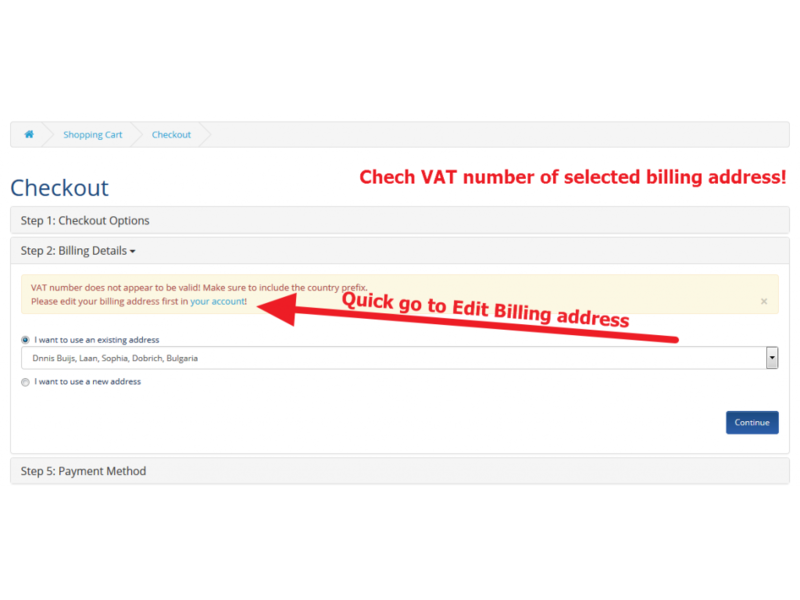 VAT number check: Setting to validate VAT number offline, online or both. VAT number invalid: Setting what to do if an invalidat VAT number has been entered 1: Show an error (orders will be rejected) or 2: Don't show an error and continue (orders will be accepted and normal tax will be applied). Reverse charge VAT in store country: If a customer in the national country of the store and add a valid VAT number, it is possible to configure of this customer will be charged VAT or VAT is exempt (Reverse charge) will be applied. 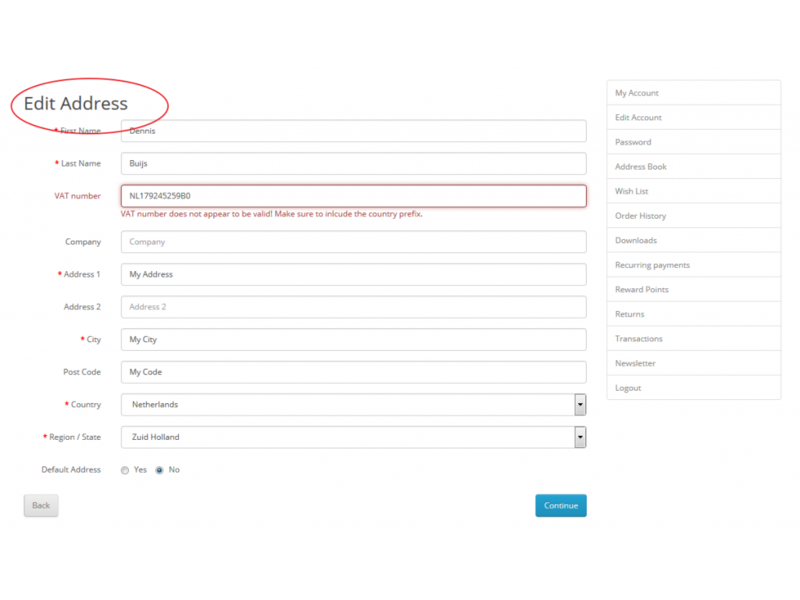 VAT number service failed: Setting how to handle when the Online VAT number service is unavailable, 1: Reject the order and show an error, 2 Only validate VAT number offline, and if VAT number is valid, accept the order. 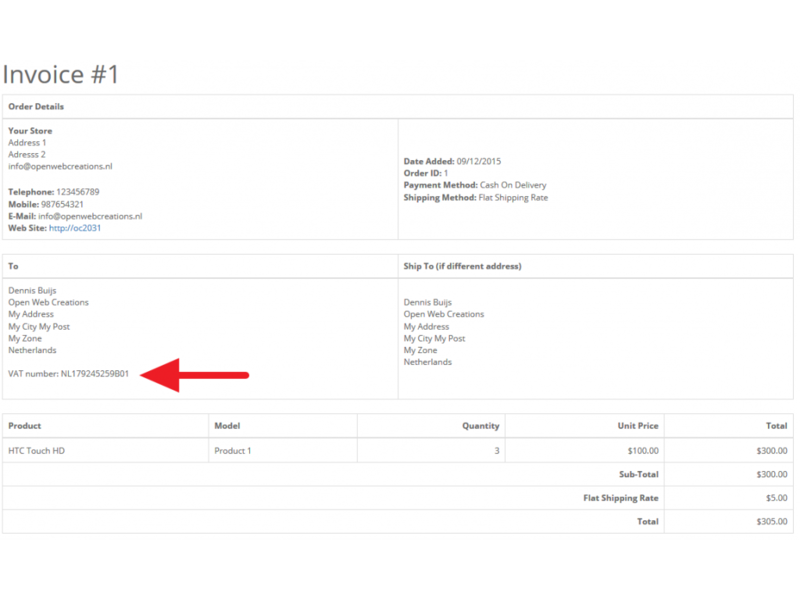 Ajax validation: The VAT number is validated through AJAX. VAT number format: Format VAT number without spaces and dots. 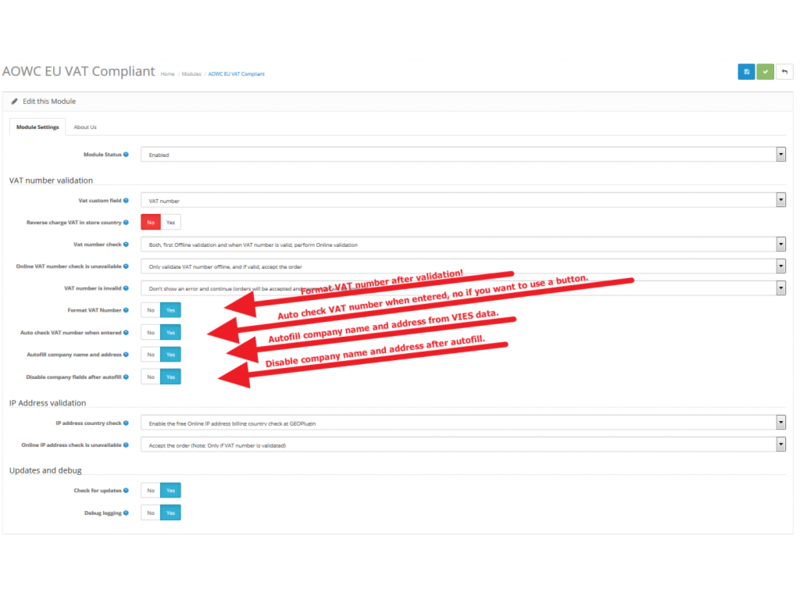 Autofill company name and address: Autofill company name and address received from the VIES database. 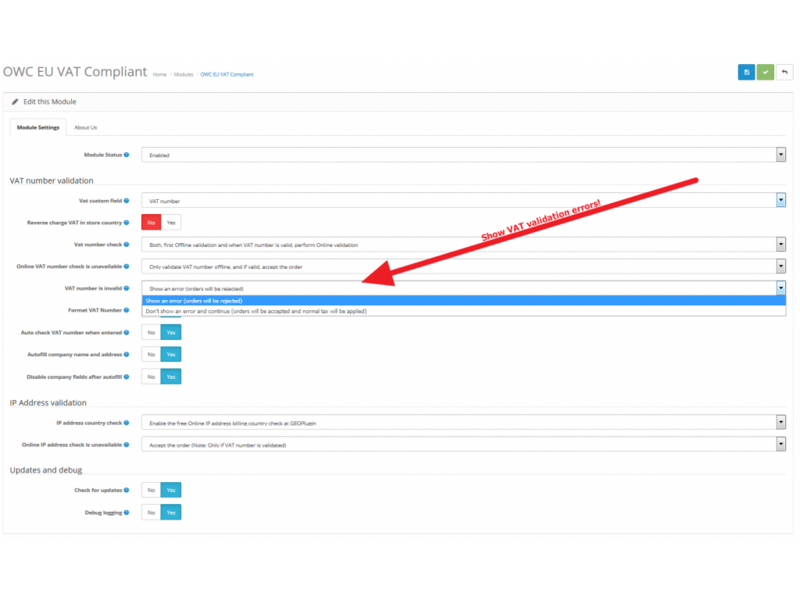 Autofill disable fields: After autofill company name and address the fields can be disabled by making them READONLY. 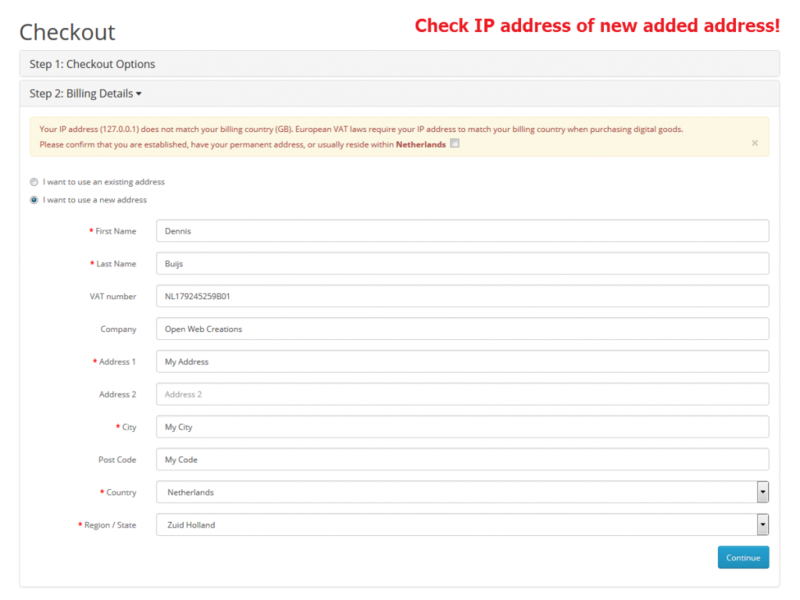 IP address country check: Setting to validate the billing addres of the buyer with the Online IP address billing country. 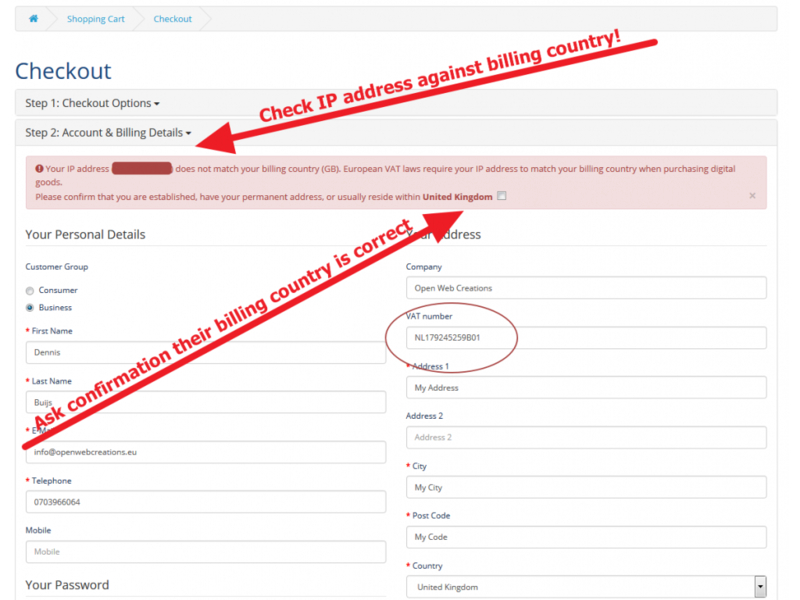 IP address country check service failed: Setting how to handle when the Online IP address country service is unavailable, 1: Reject the order and show an error, 2 Accept the order (Note: Only if VAT number is validated). 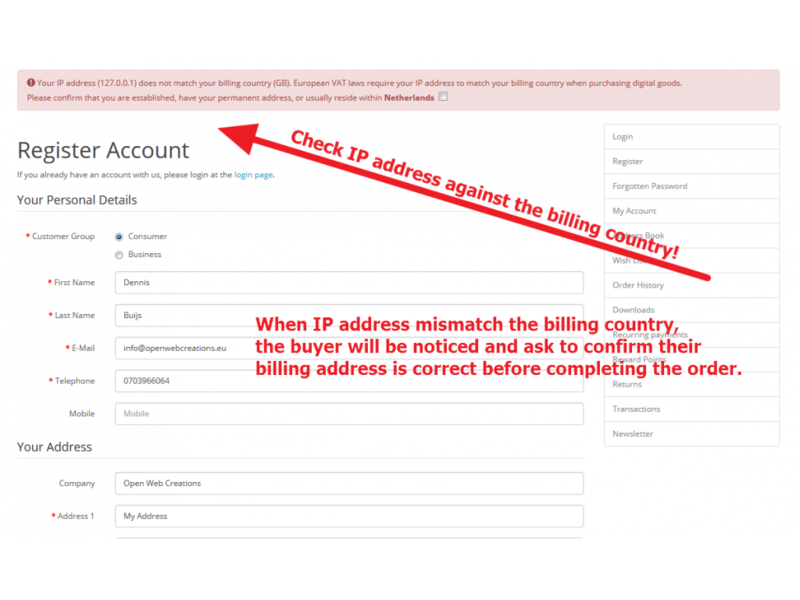 Ask address confirmation: When the buyers billing address mismatch with the IP address billing country, the buyer can confirm the billing address is correct to complete his order. 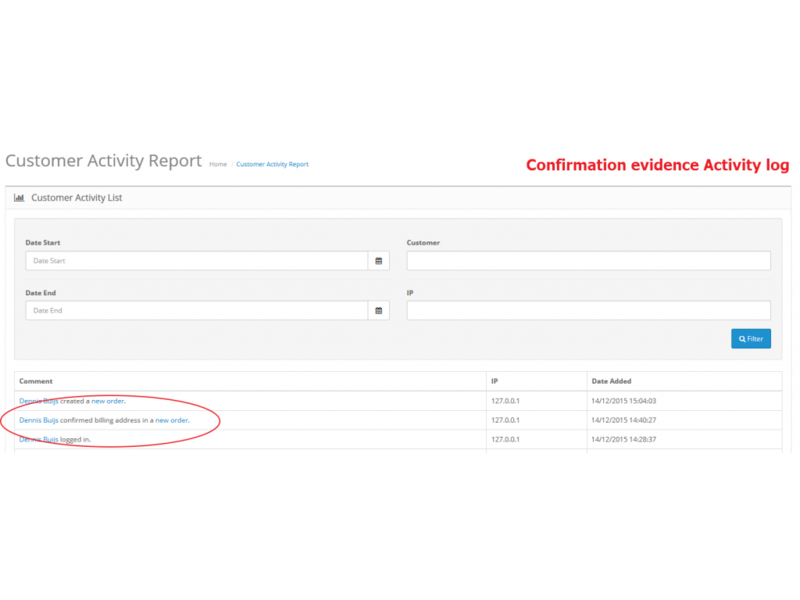 Confirmation evidence log: Each address confirmation will be logged in the 'Customer Activity' and in a special evidence logfile 'owc_euvat_ip_address_confirmed.log' in the system log folder. 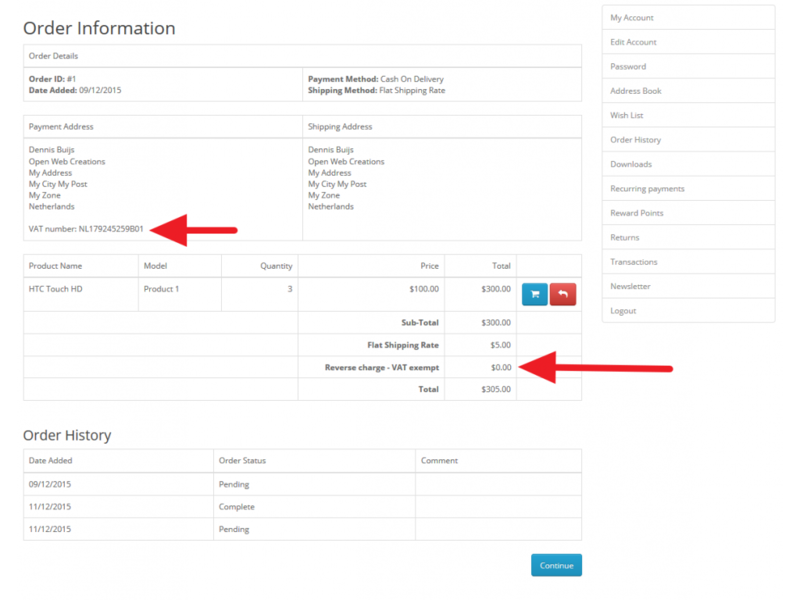 VAT number on invoice: Adds the VAT number on the invoice, front-end, admin and email. Reverse charge - VAT exempt on invoice: When VAT exempt is applied, the 'Reverse charge - VAT exempt' will be added on the invoice instead of the VAT itself. 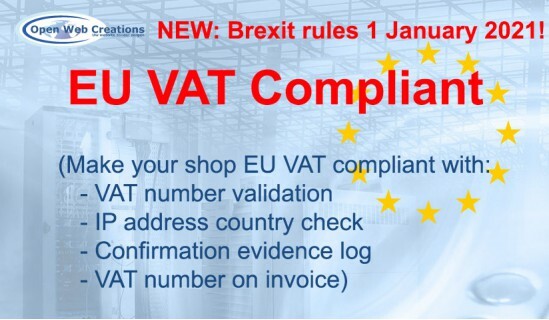 Guide for installation an configuration of the EU VAT Compliant extension. + Ajax Best Checkout extension support. 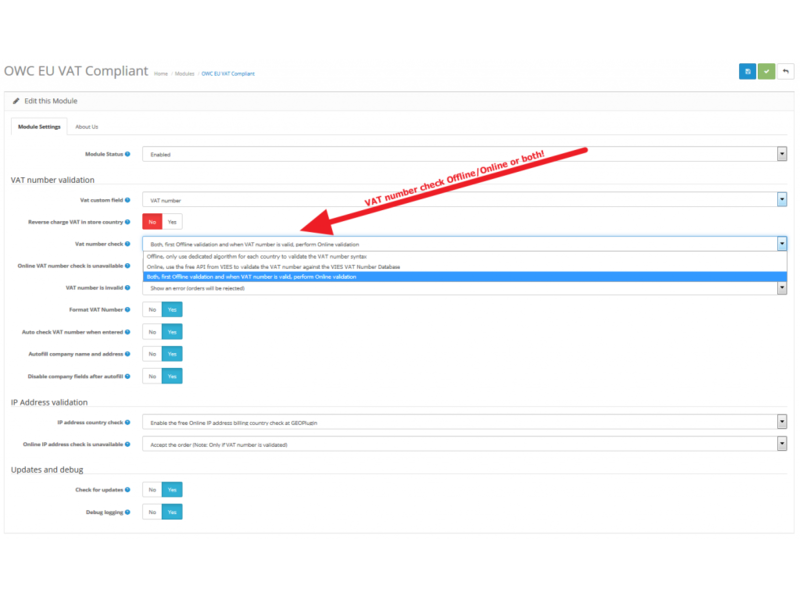 + Auto disable address fiels after auto fill now based on customer group. # Bug Fix: Products in orders now also stored with zero tax. # Bug Fix: Fixed address parsing for Latvia. + Support for Journal 3. 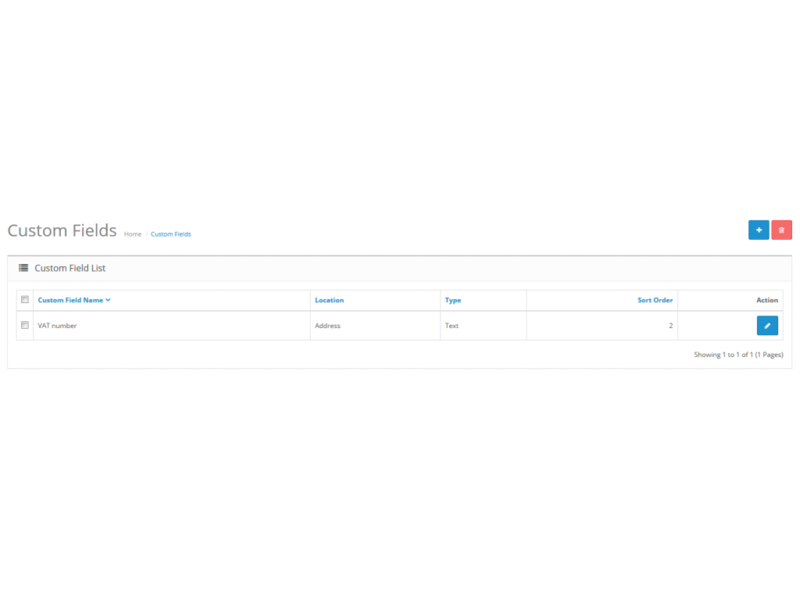 ^ Shipping address without making fields readonly. # Bug Fix: Fixed multiple times ajax vat check trigger. 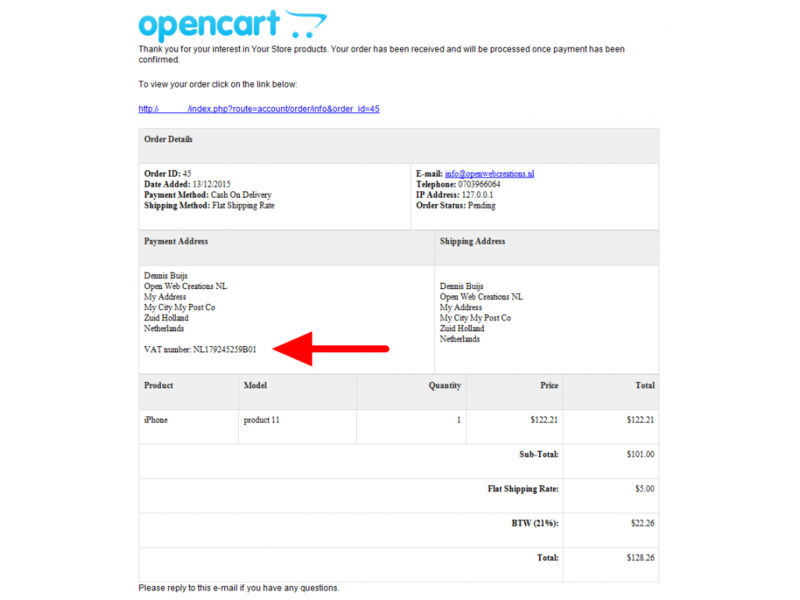 # Bug Fix: OpenCart 3 vat number in order. + Add feature to add VAT numbers also without the country prefix. # Bug Fix: EU Country missing and not accepted! # Bug Fix: Fixed some vqmod parsing problems. # Bug Fix, Loading templates problem solved. # Bug Fix: Ipaddress check failed with local address solved! # Bug Fix: Ready config value problem solved. 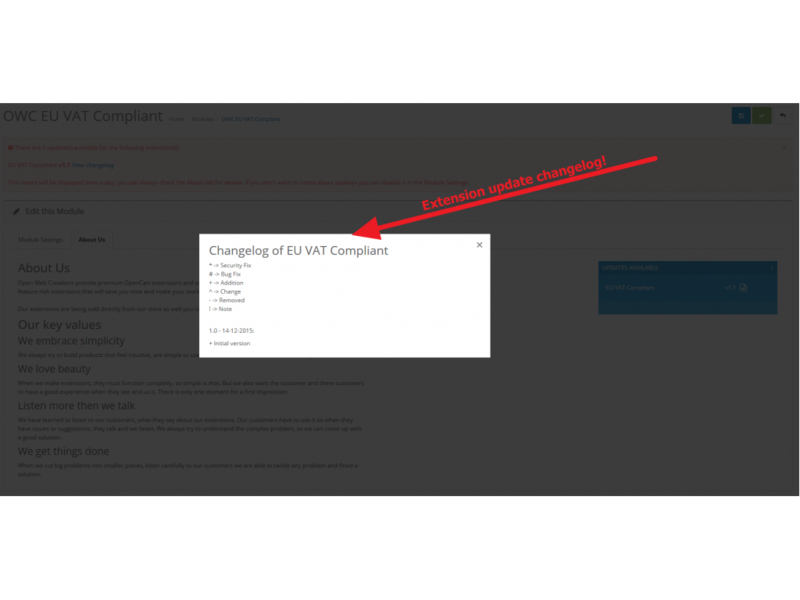 # Bug Fix: OC3 VAT number field in order email. ^ Updated the installation manual! # Bugfix, VIES check with wrong country iso codes for some countries. # Bugfix, VQMOD script in OpenCart 2.2.0.0 not executed completly. + Add support for Journal Theme with Journal Quick Checkout. ^ VAT number with spaces and'-,.' characters in it are now validated correctly. # BUG Fix, Normal VAT is charged in own store country. # Empty VAT number the buyer is charged with VAT tax. # Bug Fix: Warning when Soapclient is not installed! 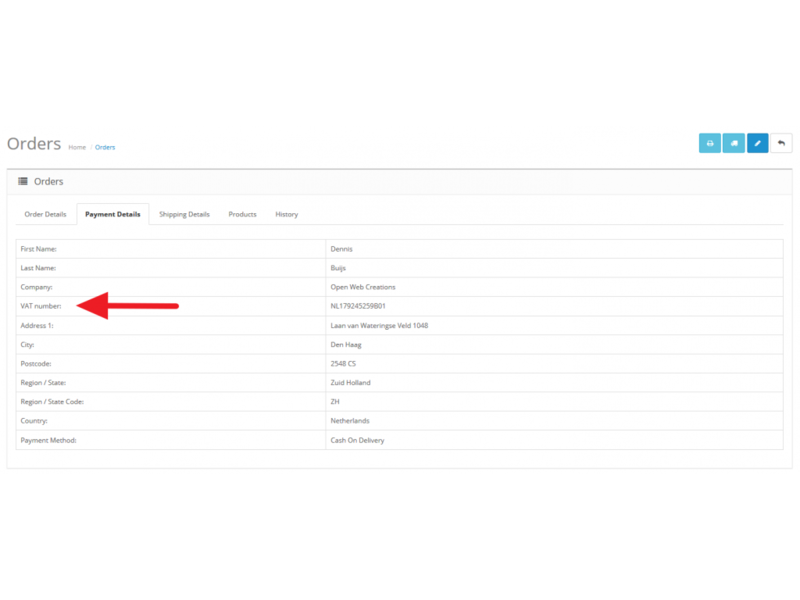 # Bug Fix: Check when vat field is in addess location. 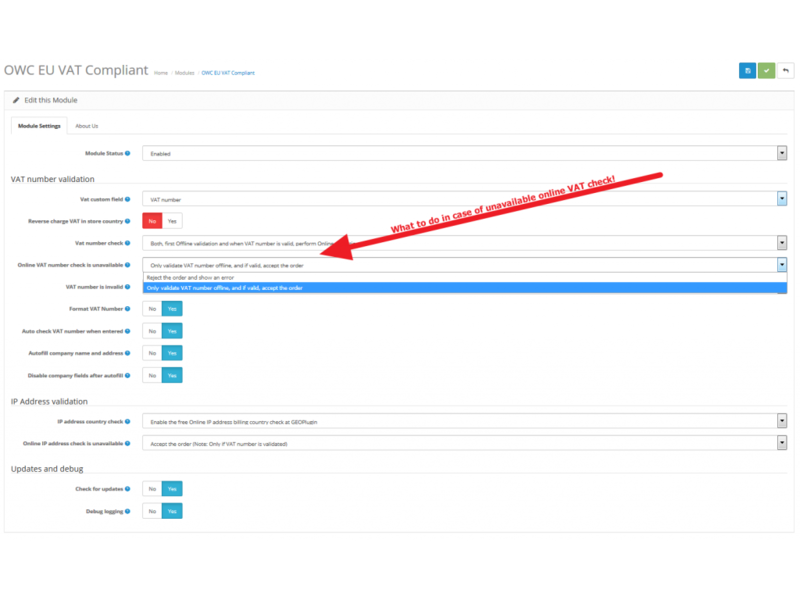 # Fixed validation VAT number URL and better error logging. # IP Address check not always executed.